On many personal notes, this collection is cool. One, I was a theater nerd in high school and I’ll be honest, I never gave much thought to the stage rigging. This collection is changing things. Two, J.R. Clancy calls my hometown its hometown. So, I’ve enjoyed getting to work with this collection which is a very good thing because we’ll be working with it in the Digital Library Center (DLC) for a long time into the foreseeable future. The J.R. Clancy stage rigging firm was established by stagehand John Clancy in Syracuse, New York, in 1885. The firm is known for innovating products and techniques for stage design including the Welch tension floor block, the automatic fire curtain, and automated stage rigging. The collection itself includes architectural and engineering drawings related to construction and renovation projects managed by the firm, including theatrical designs, drawings for standard parts, wiring diagrams, and standard assemblies for stage rigging systems. You can see the finding aid for the collection in Archon. The collection here at Florida State University was acquired through the School of Theatre several years ago with the idea that the collection would be digitized in its entirety in the future. Due to the nature of materials, and the scope of the collection (numbering in the the tens of thousands of drawings! ), we’ve been doing some major planning and thinking through the digitization project. The collection itself is still in processing which adds another challenge on top of the volume of it. So, for the moment, the collection is being digitized by patron request through the Clancy firm. The first batch of materials is now available online through this process. This set of drawings are for rigging components for the Centennial Concert Hall in Winnipeg, Manitoba, Canada which is getting ready for a renovation project and wanted the original rigging plans for their upcoming work. As we add more to this collection, we’ll be sure to highlight it here on the blog. In the meantime, the collection does have a finding aid and is available upon request in the Special Collections Research Center Reading Room. Le Moniteur Universel was a French newspaper founded in Paris under the title Gazette Nationale ou Le Moniteur Universel by Charles-Joseph Panckoucke. It was the main French newspaper during the French Revolution and was for a long time the official journal of the French government and at times a propaganda publication, especially under the Napoleonic regime. Le Moniteur had a large circulation in France and Europe, and also in America during the French Revolution. We’ve been steadily working on digitizing the run of Le Moniteur that we hold here in Special Collections and Archives for about a year now (how time flies!). We’ve provided access to the publication through the end of 1808 in the FSU Digital Library. Our run of these papers starts with the founding of the newspaper in May of 1789. So, we’ve loaded 20 years worth of the publication or over 7300 issues! We still have quite a long way to go but we’re happy to be providing online access to a publication that supports scholarship here at FSU through the Institute on Napoleon and the French Revolution as well as beyond our campus. It has been a busy year for the Digital Library Center! I wanted to take a moment to bask in our success. We also started a long-term digitization project with Le Moniteur, a periodical from our Napoleonic collections. DLC staff member digitizes a textile fragment. Collaborative digitization projects were also started with the department of Art History, for which half of the John House Stereograph Collection is now available online, and with the department of Anthropology where we hope to have materials to share online soon! All in all, we added 6,026 objects to the digital library this year which encompasses thousands and thousands of digitized book pages, letters, photographs and 3-D objects. It has been a busy and rewarding year as we keep growing how many projects we can take on each year. We’re already working on new projects for next year so stay tuned for what comes next! Archives Month is when we shout from the rooftops about archives; what are they, what do they have and why you should care. Here at FSU Special Collections & Archives, we participate in #AskAnArchivist day and put together other activities as we are able each year. However, we deal with the most obvious question people could ask 365 days a year…what does an archivist do? For me, that question is usually a double head scratcher because not only am I an archivist, I am a digital archivist. In my daily work, that is really broken down into three main areas of work: digital project management, digital library management and born-digital material management and preservation. All of which are still probably Greek to you so let me explain. No one told me when I went to get my MSI that I should have probably worked on becoming a certified Project Manager too. Instead, I’ve had to learn by making lots of mistakes as digital projects come through the Digital Library Center. 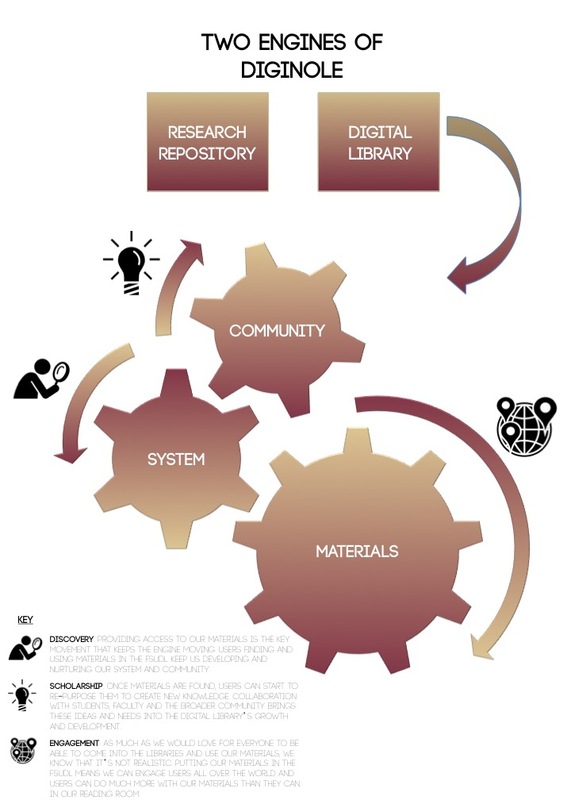 Unfortunately, we have not come up with a magic way to digitize materials and get them into the FSU Digital Library so a lot of planning and then work goes into any set of materials you may find online. I enjoy this part of my work (it’s the organizer in me) but it wasn’t exactly what I thought I was signing up for when I became a digital archivist. 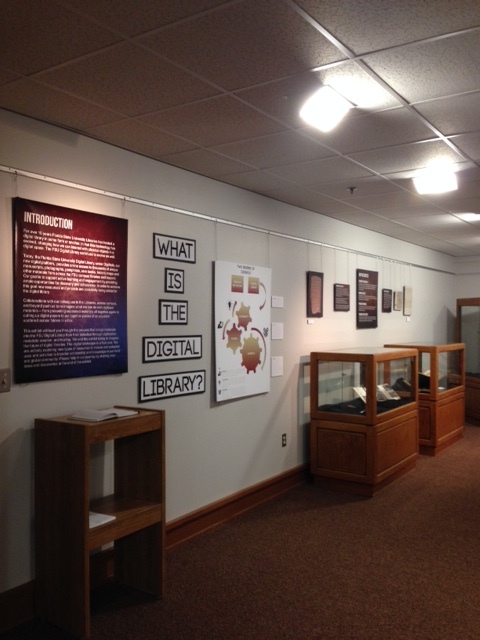 The FSU Digital Library has grown fast since we moved into our new platform in February 2013. 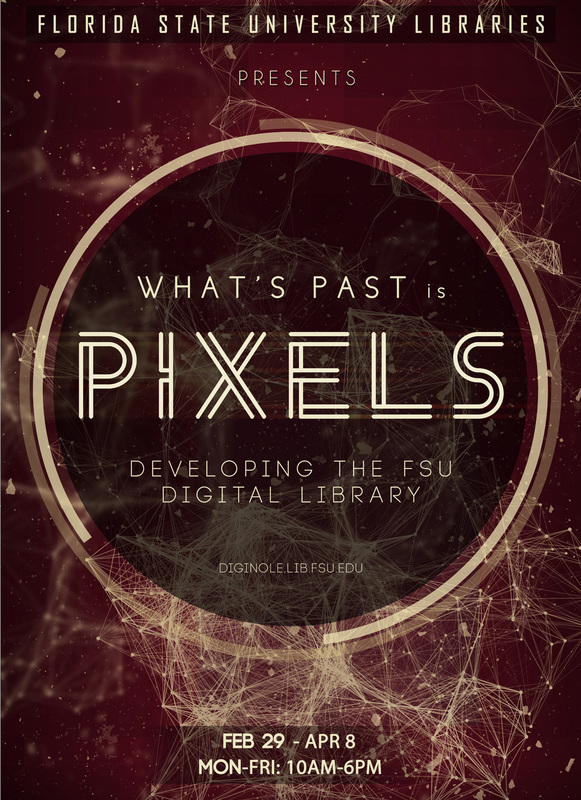 The FSU Digital Library grows in leaps and bounds each year and a team of us work on making sure it grows within our standards and in a way that keeps it useful and relevant for our users. Once a digital project is started, a lot of my work goes into figuring out a user’s needs when interacting with said material. What collection does it belong in? How does it need to be searched? What display would best suit the materials? This is the part of the job I am still growing into and learning more about all the time. It’s the part of archives a lot of us don’t know what to think about yet. But, take this fact and stew on it: The Word document you created today is a let less stable than the letter someone wrote 100 years ago. We know how to preserve and protect the paper. The Word document? We’re still figuring that out. As FSU Libraries moves into deciding how we’ll process, provide access and preserve digital records (including web content), I’ll be sure to share more about that aspect of my work on the blog! So, at the end of the day, I usually tell people that a digital archivist is someone who gets to live in the best of both worlds; I get to handle and work with the cool old “stuff” but also work with all the cool 21st century gadgets which help archives to make these items more accessible while also dealing with any other 21st century document problems the archives wants to throw at me. Bring it on! What is the most viewed object in the Digital Library? We get asked this question a lot from people. Most are simply curious. However, to the staff of the FSU Digital Library (FSUDL), this is actually an important question. 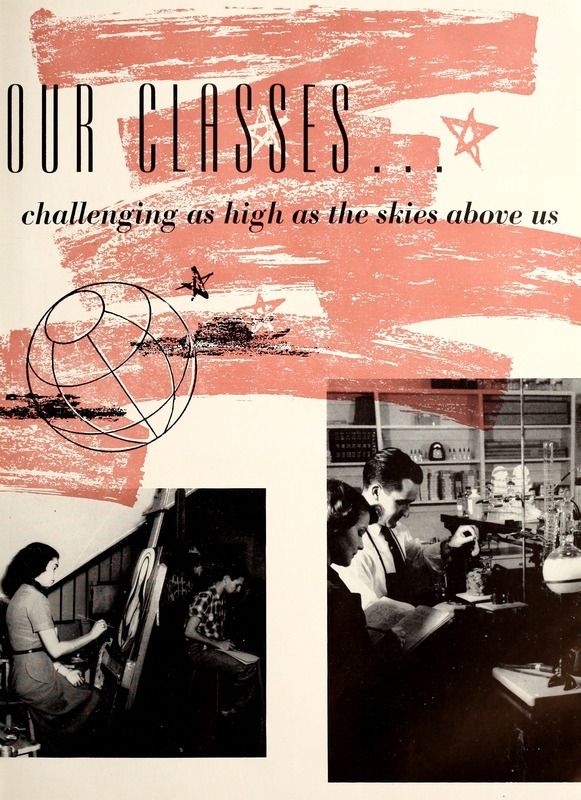 Understanding what our most viewed objects are can help us decide what materials to digitize and make public next for our users as well as understand where current research interests lie within the FSU community. However, it’s not quite as simple as looking at Google analytics or the basic collection usages statistics that our digital library platform gives us. We’ve only had some of our statistic reporting tools in place for a short amount of time so what Google says is our most viewed collection doesn’t necessarily match what the Digital Library itself tells us. For example, Google says that our Yearbook collection is the most viewed collection in the Digital Library; our Digital Library tells us it’s the Heritage Protocol & University Archives collection, the Yearbook’s parent collection, that is most viewed. This shows the different granularity upon which the two systems collect information; one is looking at the entirety of the Digital Library; the other is looking only at a certain level at any given time. That difference is why we need both systems tracking together to get us the information we need to make decisions about projects moving forward in the FSUDL. It’s also helping us to continue to refine how we collect usage information from the FSUDL. While the Digital Library platform might not be the best fit for tracking what collection is most viewed, it is the platform which can tell me the answer to the question that prompted this blog post: what is the most viewed object in the Digital Library? Right now, this still is not an easy question to answer (takes a bit of work to get it out of the DL system) but I can say that the Tally-Ho of 1952 (the FSU student yearbook) has been viewed 990 times since we started tracking at object level at the beginning of this year. In second place is Paul Dirac’s dissertation with 755 views and rounding out the top 3 is a Ringling Bros. and Barnum and Bailey clown college (because who doesn’t love clowns?) In fact, this item is also in our top ten of exit pages meaning this object is often what people are looking for so they leave the FSUDL after finding it. We’ll continually be working on tracking usage in the Digital Library to make sure the materials we share in the digital environment are the most useful and interesting to all our users. What do you think we should digitize next? In the first post in this digital preservation series, I shared some of the unique challenges digital material brings to the preservation game. In this one we will look at some of the technologies and tools digital stewards employ to protect our digital assets. How can you tell when a computer file has been corrupted? If you try to open it funny, glitchy things might happen. How can you test whether a digital file is uncorrupted? This requires a bit more thought. Digital files are at their base-level a long string of 1’s and 0’s. This is called the file’s bitstream. Preservationists could compare one bitstream to an earlier copy of it, but this requires a lot of processing power for large files, with no guarantee that your comparison copy isn’t also corrupted. Hash functions can also be applied to the bitstream of a file. Due to the nature of the various algorithms used even a single change in a one or zero will produce a drastically different checksum. If at the beginning of the preservation process a digital steward produces a checksum for the bitstream, she can now test for data integrity by rerunning the hash and comparing that output to the original checksum. Now that we can test for unwanted changes in computer files, how can we ensure we always have a valid copy of it? A system called LOCKSS can help with this. LOCKSS sta nds for Lots Of Copies Keeps Stuff Safe. Similar to the idea of backing up personal files, LOCKSS will duplicate the files given to it and then distribute copies of files across several servers. The idea is to spread the system out over many servers in diverse geographic areas to minimize the risk of a single disaster (natural or otherwise) compromising the entire system. These distributed copies are then regularly hashed, and the checksums compared to test the validity of the files. If a checksum comparision fails, that server can delete it’s failing copy of the file, and ask the other servers for a new one. Digital preservation is a rapidly developing field. New challenges requiring new solutions arise every day. In the third and final post in this digital preservation series, I’ll discuss activities you can undertake to protect your personal digital heritage.